Darn! I missed 529 day. The College Savings Plans Network sponsored National 529 College Savings Day this past Wednesday, 5/29/13. Many states sponsored promotions for their 529 plans, with some offering special incentives that are still in effect. Florida, for instance, is waiving the $50 enrollment fee for plans opened from May 20 through June 30. You can check out individual states’ events and promotions by clicking on this map. In general, 529 plans are college savings and investment accounts sponsored by state governments. Money deposited in the accounts grows tax free, as long as the funds are used for educational purposes when withdrawn. You don’t have to be a resident of a particular state to use its plan, although some states offer additional tax benefits to in-state plan participants. Most 529s are designed as traditional savings-and-investment vehicles, but some states offer prepaid 529 plans, which allow savers to pay tuition at certain schools in advance at current rates. The Obama administration and other supporters believe that not enough borrowers are taking advantage of Income Based Repayment (IBR), a student loan forgiveness program. However, since it is higher-income college graduates who “ultimately end up benefiting overwhelmingly from IBR”, I’m not sure this is a problem. IBR reduces loan payments based on a percentage of income, subsidizes interest charges, and forgives loan balances after 25, 20, or 10 years. It sounds like a nice deal. However, knowledge of the IBR “remains a largely obscure concept for many cash-strapped college graduates”. It is estimated that only about one-half of qualified borrowers are taking advantage of this free money. Such low figures have shone a glaring spotlight on the DOE’s failure to sufficiently educate borrowers, according to consumer advocates like Mark Kantrowitz, the publisher of FinAid.org and FastWeb.com, who estimates that as many as 3 million students could qualify. Old IBR applies to initial loans dated on or before October 1, 2007, while the more generous New IBR applies to loans after that date. The millions of borrowers who qualify but do not participate are “effectively leaving a rather sizable amount of money on the table”. Some of the most generous IBR benefits go to graduates who take jobs in non-profit or government sectors because their loans are forgiven after only ten years. Jason Delisle, director of the Federal Education Budget Project at the New America Foundation, advises college graduates to take advantage of this benefit. Indeed, the IBR savings that accrue to borrowers who pursue such career paths can be mind-boggling. IBR produces “far more benefits” to higher-earning graduates. But it’s not only those who work in public service professions who benefit disproportionately from IBR, according to Delisle. “The program provides far more benefits to those at the higher end of the income spectrum,” he noted, such as doctors, lawyers and those with MBAs. “While the program provides very large subsidies when your income is low,” he said, “it really doesn’t claw those benefits back if your income ends up being high,” meaning graduates with large sums in student loan debt—ordinarily graduates of medical, law and business schools, who typically make higher starting salaries—ultimately end up benefiting overwhelmingly from IBR. So a student who graduates from Harvard Law School with $150,000 in student loans and goes to work at a law firm making close to six-figures annually still stands to receive a “windfall”—as Delisle calls it—of six-figures in principal and interest forgiven on average. IBR cheerleader says everyone should borrow for college because the taxpayers “pick up any downside risk or loss”. Because of IBR there’s “no reason not to pursue a graduate degree and borrow to pay for it,” said Delisle. Sounds like a lousy program to me, speaking as a taxpayer. Up to 20% of American children suffer from mental disorders, but the accuracy of reporting is questionable. Scientists at the U.S. Centers for Disease Control and Prevention found that 13% to 20% of American children age 3 to 17 experience mental disorders each year, and that rates have been increasing. The study also showed there are no standard ways of counting afflictions, but a hodgepodge including parental reports or reports directly from children. Some disorders, such as bipolar disease and anxiety disorders, weren’t included in the overall rates for lack of data. The disorders that were included span a wide range, including hyperactivity and severe autism. Statistical experts are skeptical of the reported numbers. Data collection is inconsistent, with random phone surveys of parents yielding higher results than other methods. Families with health insurance report higher rates, and regional differences raise suspicion about different approaches in diagnosis. Double counting children with multiple disorders leads to inflated rates. French children have much lower rates of diagnosed ADHD. In the United States, child psychiatrists consider ADHD to be a biological disorder with biological causes. The preferred treatment is also biological–psycho stimulant medications such as Ritalin and Adderall…. And then, of course, there are the vastly different philosophies of child-rearing in the United States and France. These divergent philosophies could account for why French children are generally better-behaved than their American counterparts…. … French parents have a different philosophy of discipline. Consistently enforced limits, in the French view, make children feel safe and secure. Clear limits, they believe, actually make a child feel happier and safer … French parents believe that hearing the word “no” rescues children from the “tyranny of their own desires.” And spanking, when used judiciously, is not considered child abuse in France. In an interview with The Atlantic, Gary Greenberg, a practicing psychotherapist and author of The Book of Woe: The Making of the DSM-5 and the Unmaking of Psychiatry, says no one can define “mental illness”. That distinction is made by a clinician, whether it’s a family doctor or a psychiatrist or whoever. But nobody knows exactly how to make that determination. There are no established thresholds. Even if you could imagine how that would work, it would have to be a subjective analysis of the extent to which the person’s functioning is impaired. How are you going to measure that? Doctors are supposed to measure “clinical significance.” What’s that? For many people, the fact that someone shows up in their office is clinical significance. I’m not going to say that’s wrong, but it’s not scientific. And there’s a conflict of interest — if I don’t determine clinical significance, I don’t get paid. Is a child autistic or just awkward? Special education services and insurance coverage are controlled by committee decisions on what is to be included in the DSM. … You can’t just ask for special services for a student who is awkward. You have to get special services for a student with autism. In court, mental illnesses come from the DSM. If you want insurance to pay for your therapy, you have to be diagnosed with a mental illness…. Homosexuality was declassified as a DSM disorder in 1973. And I’m sure I’m not the only one who has considered that Oppositional Defiant Disorder (ODD), characterized by “negativistic, defiant, disobedient, and hostile behavior toward authority figures that persist for at least six months“, is a particularly arbitrary disorder. Especially for parents who had their children when they were in their 30s or later, the crunch of paying for college while trying to save for retirement can be tough to manage. The Family CEO gives advice for families who find themselves in this situation. Reduce other expenses to free up cash for these goals. … It might be something big, like driving a car with high payments. Or something small, like have premium cable channels that you never watch. Big or small, eliminating some of these expenses and directing them to retirement or college savings can help you meet those goals. I have neighbors who put their kids through college debt-free using this strategy. Exercising great discipline, they gave up one of their cars, fancy vacations, most clothing purchases, and housecleaning services during the six years they were paying college tuition. It’s certainly not easy, but it can be done. Create new streams of income or boost the ones you have. In some cases this is quite feasible – consultants can take on extra clients, teachers can tutor on the side, SAHMs can go back to paid employment. But sometimes it’s hard to find new money, and even then the amounts are meager. The whole family can get in the act; maybe a teen can earn spending money from a summer job. If you need to choose one, choose retirement. … there are multiple ways to pay for college, but no one is going to fund your retirement for you. Since time is not on their side, older parents in particular should avoid skimping on their retirement savings. It can be a hard decision for parents to put their needs above those of their children, but here’s one way to think about it. It’s like putting on your oxygen mask first on an airplane. Make sure you’re taking care of yourself, so you can in turn take care of them. The question of whether the federal government profits from student loans has come up recently in discussions about the various proposals to prevent the scheduled Stafford subsidized loan rates from doubling to 6.8% on July 1. This question puzzled me when I wrote about it last November. At that time I found conflicting accounts, which frankly made my brain hurt. Since I was left with a lingering curiosity about these illusive profits, the recent discussions on the topic caught my attention. On May 16 the Huffington Post reported of projected federal profits exceeding those of Exxon, Apple, and other corporate giants. 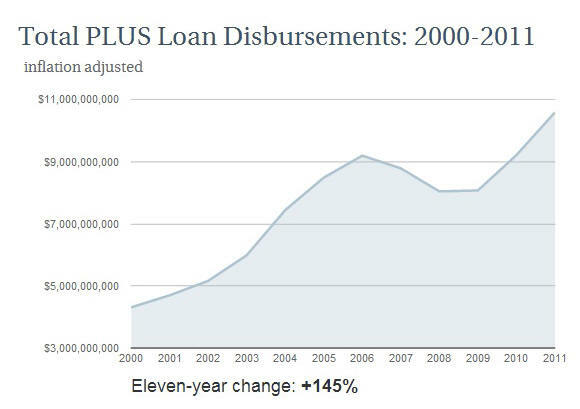 The Education Department has generated nearly $120 billion in profit off student borrowers over the last five fiscal years, budget documents show, thanks to record relative interest rates on loans as well as the agency’s aggressive efforts to collect defaulted debt. But that rate is set to double to 6.8 percent, the rate for unsubsidized loans (for richer students, or poor students with debt above the subsidized loan program’s limits), on July 1. The Washington Post, in reporting on the political disagreements in Congress, referenced the DOE’s $51 billion projected profit. Democrats … objected to increasing the rates within a program that generates vast income for the federal government. The Congressional Budget Office this week revised its figures this week, reporting that federal loans will generate almost $51 billion this year. Over the last five years, that sum is almost $120 billion. “That $51 billion is more than Exxon,” Miller said. “It’s time we stop using federal student loans as a profit center,” added Rep. John Tierney, D-Mass. Writing for Yahoo Finance, Jason Delisle disputes this notion of student loan profits, pointing out that the high risk of default must be considered. What about Senator Warren’s claim that the government makes money off loans to low-income students? Senator Warren is not telling the whole story here either. She points to figures that the non-partisan Congressional Budget Office says “do not provide a comprehensive measure of what federal credit programs actually cost the government and, by extension, taxpayers.” In fact, when the budget office “accounts more fully… for the cost of the risk the government takes on when issuing loans,” it reports that Subsidized Stafford loans – those made to low-income students – cost taxpayers $12 for every $100 lent out, or $3.5 billion per year…. Finally, in the May 20 Washington Post WonkBlog Dylan Matthews concludes that the “federal government does not profit off student loans”, at least not “in some years”. Matthews reiterates that the interest rates do not reflect market risk. … they set the interest rate on student loans below the market rate. And because they’re below the market rate, that costs the federal government money. Contrary to popular belief, and many a breathless article, the government does not, in fact, book a profit on student loans. As New America’s Jason Delisle has explained, that’s because the Congressional Budget Office is required by law to use a bizarre and faulty method for determining the cost of government loans. Matthews goes on to explain what is essentially an unresolved dispute on the profitability of government student loans. Additional details complicate the picture. For example, even according to the CBO’s “bizarre and faulty” calculations, some years with higher subsidies actually show a loss. I suspect there’s no profit. After reading all these explanations, the most definitive statement I will accept is that it appears the government does not make a profit on student loans, but it might depend on the level of subsidies for any given year. As the headline says, it’s complicated. Study finds that “high-achieving students tend to get the most experienced teachers”. Even within the same school, lower-achieving students often are taught by less-experienced teachers, as well as by teachers who received their degrees from less-competitive colleges, according to a new study by researchers from the Stanford Graduate School of Education and the World Bank. The study, using data from one of the nation’s largest school districts, also shows that student class assignments vary within schools by a teacher’s gender and race…. The assignment of teachers to students is the result of a complex process, involving school leaders, teachers and parents. While principals are constrained by teachers’ qualifications – not all high school teachers, for instance, can teach physics – they also may use their authority to reward certain teachers with the more desirable assignments or to appease teachers who are instrumental to school operations. Teachers with more power, due to experience or other factors, may be able to choose their preferred classes. Parents, particularly those with more resources, also may try to intervene in the process to ensure that their children are taught by certain teachers…. … certain teachers – those with less experience, those from less-competitive colleges, female teachers, and black and Hispanic teachers – are more likely to work with lower-achieving students than are other teachers in the same school. Do AP teachers need to be the most knowledgeable? … Teachers from more competitive colleges may have deeper subject knowledge than their colleagues from less-competitive colleges, leading principals to assign them to more advanced courses, the researchers said. Bloomberg Businessweek gives us the The New Rules for the Modern Workplace. New college graduates probably understand these new rules better than older workers do. The current state of our economy has transformed the workplace and how we manage our careers. There is no longer such a thing as a linear career path. A college degree doesn’t magically turn into a job and an MBA doesn’t mean you’ll automatically get a promotion. Even if you get a job, it’s not stable and you won’t be staying with the same employer for life…. Rule No. 1: Your job is temporary. Where you start isn’t where you’ll end up. Your job, company, and profession may completely change because of mergers and acquisitions, layoffs, outsourcing, automation, and various other factors that are outside your control. The U.S. Bureau of Labor Statistics reports that the average American will have about nine jobs from the age of 18 to 32. The job you’re in now is just a stepping stone along your path. New York City Mayor Mike Bloomberg says average students should skip college. Mark Kantrowitz disagrees, believing that most students should attend college and pointing out that many colleges cost less than $50,000.